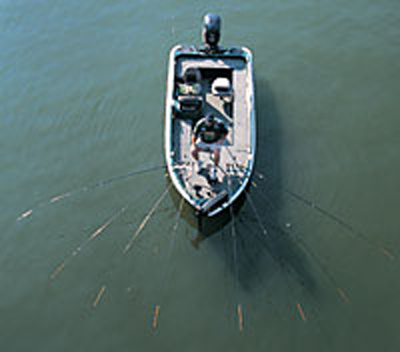 The slow-trolling method known as spider rigging has been used for years to catch boatloads of crappies on almost any body of water in any weather and water conditions. Boats toting numerous long crappie poles, from bow to stern, are a common sight on Dixie lakes, where crappie crafts look like mutant water spiders skimming across the surface. Spider rigging on windy days can be tough, to control both your boat and your lure presentation. Adding weight to the bow of his boat helps Tony Edgar stabilize his craft in choppy water, but the rolling waves can still cause his spider rig poles to bounce too much. He recalls winning a tournament on his home waters of Lake of the Ozarks by rigging his poles with big corks and leaving slack in his lines to allow the floats to roll with the waves. This presentation kept the baits gently rolling with the wave action rather than bouncing up and down in an unnatural fashion. If the wind becomes too strong for Charlie Hildreth to control his boat in water less than 10 feet deep, he stakes out an area to fish with bobbers. Hildreth has devised an adjustable two-piece PVC pipe with a T-handle and auger that he can shove into the water and screw into the lake bottom. Then he ties his boat to the pipe and tosses out bobber rigs that the wind pushes through the area. He also has two different trolling motor props for windy or calm weather. Through trial and error with various speeds and props, he has mastered the strolling formula. In dirty water you have to go slow, and in clear water you can go almost as fast as you want.